Take your place in the agile work culture: with a systematic, stress-free approach. How can we ensure that work is always a success even though it’s likely to become increasingly flexible? 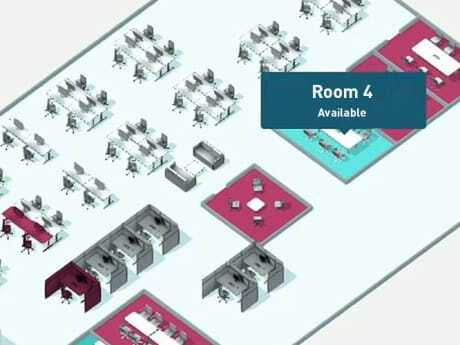 How can we organise rooms and processes efficiently even though people are working everywhere? How can we empower agile project teams so that they can work within a structure whilst remaining healthy? The transformation in the workplace involves numerous challenges. With K+N SMART.OFFICE we turn the challenges into opportunities. Social trends and developments change the way we live and communicate. This has a radical effect on our understanding of work and the workplace. A multi-territorial approach, activity-based working and digital collaboration are the factors that characterise the workplace of today. Flexible work models have seen a blurring of the boundaries between working and living – the result is a new set of functional requirements. König + Neurath offers answers to these challenges: new furnishing solutions promote agile working and allow scalable working scenarios. Individually adaptable furniture encourages people to keep moving and stay healthy. We also support companies with our K+N SMART.OFFICE product, setting them up to counter the transformation in work culture actively. 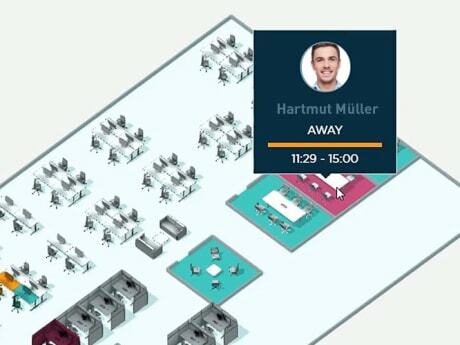 Our solution networks rooms, furniture and people, optimising communication and organisation to adapt the workplace so that it’s geared to the needs of employees. Not the other way around. 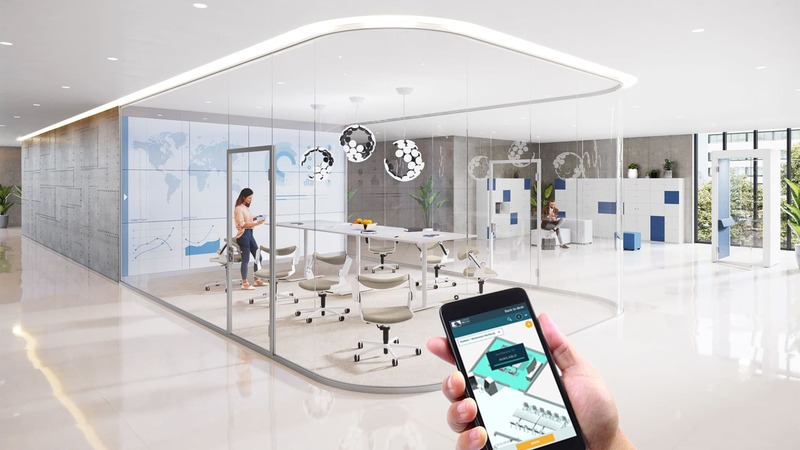 We network the room, furniture and people via an app on your smartphone or desktop PC that allows you to organise and analyse your agile office. Work cultures are changing. The office has been more than just an office for a while now. Find out how K+N SMART OFFICE can help you analyse, plan and organise space as well as resources – allowing you to react to changes and create spaces in which people feel comfortable. We show you a few short video clips to demonstrate how simple our tool is to use. 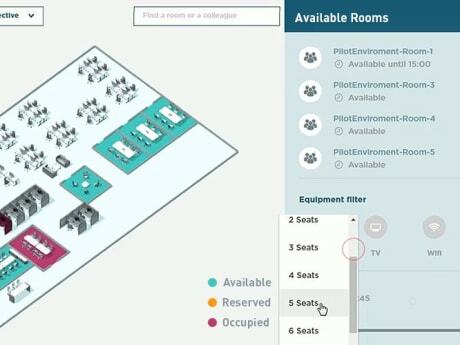 Find and book a free meeting room quickly and easily. This is how to find your team members easily in an agile organisation. Using predefined filters to book specified resources. 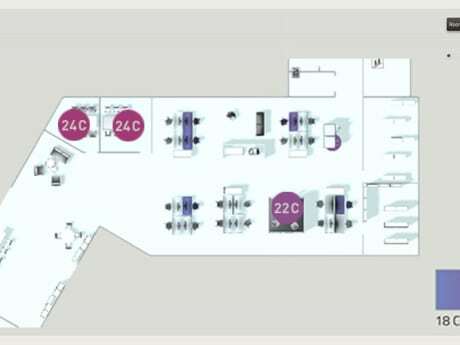 Efficient use of space is a widely discussed theme where organisation of office and administration buildings is concerned. 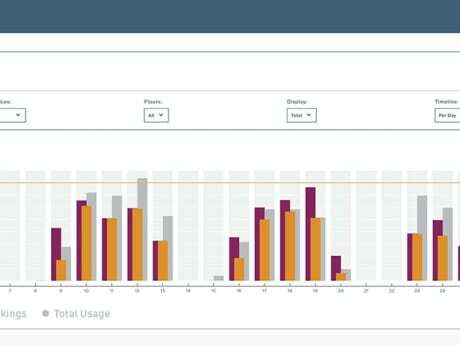 Those in senior roles in Facility Management are familiar with the difficulties associated with optimisation of space use. The main challenges arise due to the lack of transparency, as well as personal arguments – some of which are emotional. The planned need frequently fails to reconcile with reality, but there’s no reliable information about the actual space requirements. This is precisely where K+N SMART.OFFICE can support you highly effectively. You see, our solution enables you to collate transparent information regarding the use of resources. 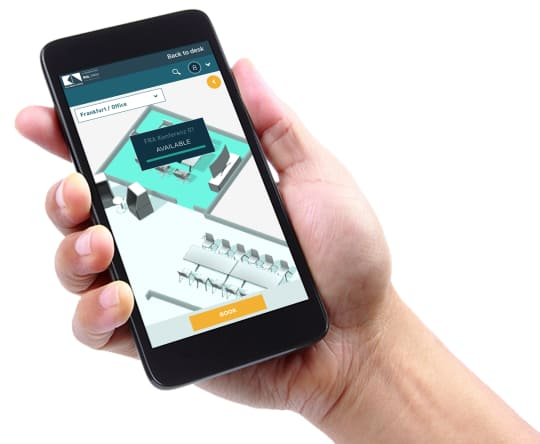 Thanks to the various reports that provide you with real-time results, you can find out which rooms and resources are being used in a particular department – or anywhere in the company. You can identify the actual need based on valid information. This usually involves the potential to save between 10- 30% (based on the cost of the space alone). With K+N SMART.OFFICE you’re in a position to pick up on necessary changes more quickly. The information collected this way puts you in a position to actively process rearranging/restructuring suggestions concerning your space capacity with shorter planning phases. 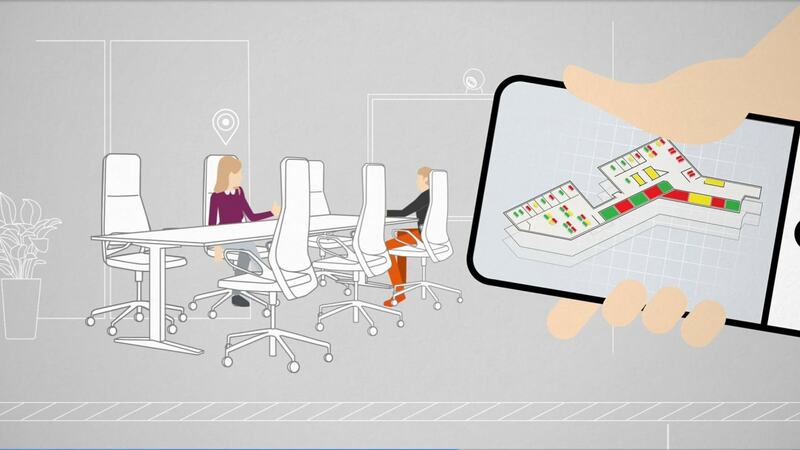 A graphic representation quickly gives you an overview of space use for meeting and conference rooms. You have rapid access to a clearly presented summary of the temperatures in offices and meeting rooms. Companies are facing new challenges today. Changes in society call for rethinking of many things. Digitisation, stiffer competition and the War for Talents are just a few examples of areas in which the change can be felt. How can digital solutions help to make the difference here? K+N SMART.OFFICE helps companies to create a positive work environment. Employers are particularly likely to impress their skilled workers now and in the future with the “soft factors”. 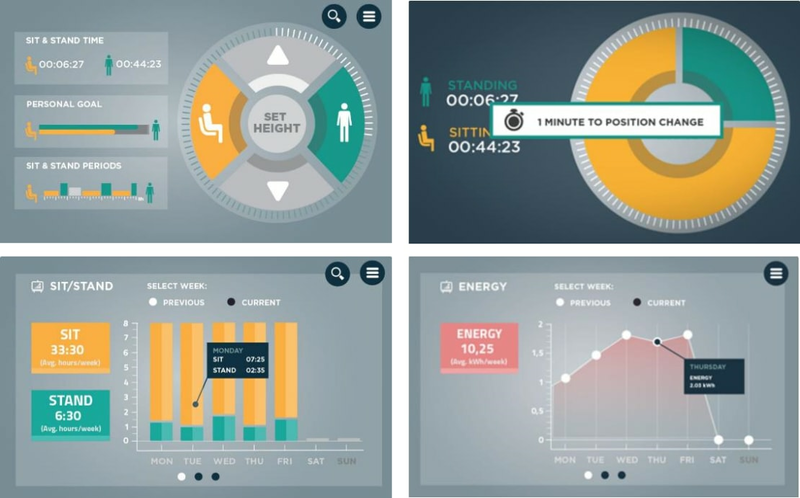 You can set new standards with this innovative tool – and actively encourage agile and interdisciplinary cooperation. More transparency throughout the organisation and a self-driven approach to working are indicative of an open corporate culture. Make it easy for your teams to organise project areas in the office, find colleagues or meeting rooms, and book technology for the next presentation – all of this is really straightforward with K+N SMART.OFFICE. We know that sitting at your desk constantly to work is no good for your back. It shortens the muscles along the back of your leg, and your lower back attempts to compensate, which puts too much strain on the lumbar vertebra in the long term. Our performance capacity also plummets if we stay in the same position all the time. With K+N SMART.OFFICE you’re giving your team a tool that will help individual employees to incorporate more activity into their daily work routine. 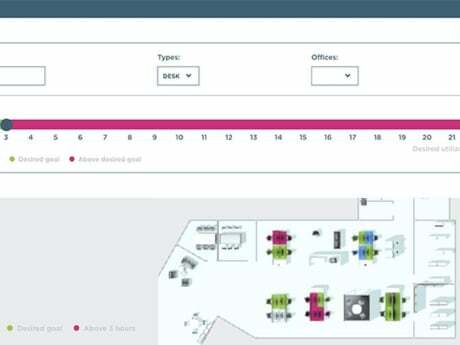 Our solution gives every user the opportunity to control and track their own personal activity at work. This ensures that desk work and movement are not polar opposites, and that you promote the health of your employees by facilitating more movement during the working day. Of course you also have the option of anonymised tracking. Our tool provides you with the support you need to set new organisation and communication standards in your company! K+N SMART.OFFICE is a web-based solution – which makes it ready for use on any operating system, and therefore any device. 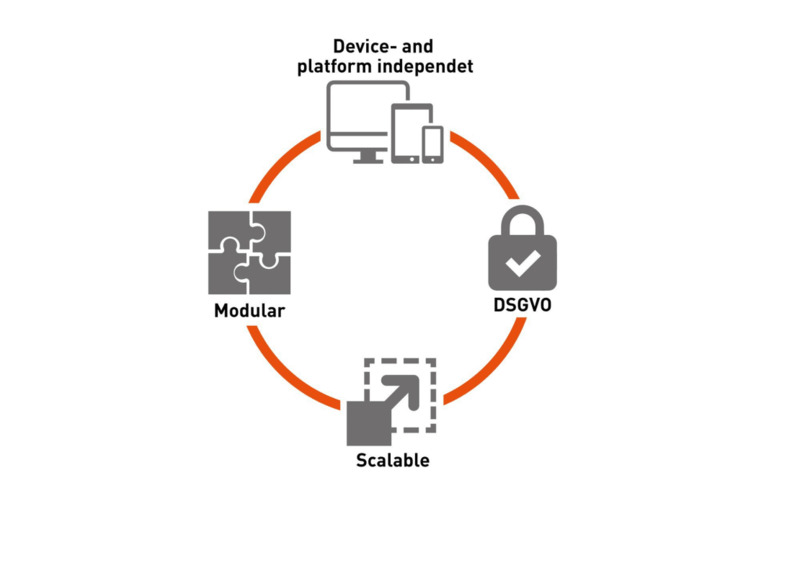 It’s modular and scalable, which means that its various development phases can be customised to meet your exact needs. Of course the system fulfils all GDPR requirements too.